Hardware developers, hardware/software integrators, and embedded software developers will appreciate the range of capabilities of the TLA7ACx Series logic analyzer modules. 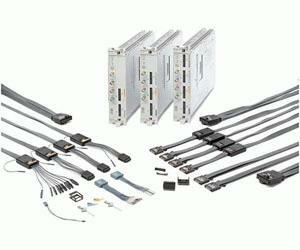 Its broad feature set includes capturing and correlating elusive hardware and software faults; providing simultaneous state, high-speed timing, and analog analysis through the same probe; using deep state acquisition to find the cause of complex problems; real-time, nonintrusive software execution tracing that correlates to source code and to hardware events; and nonintrusive connectorless probing. The TLA7ACx Series logic analyzer modules offer the Tektronix breakthrough MagniVu technology for providing high-speed sampling (up to 8 GHz) that dramatically changes the way logic analyzers work and enables them to provide startling new measurement capabilities. The TLA7ACx modules offer high-speed state synchronous capture, high-speed timing capture and analog capture through the same set of probes. They capitalize on MagniVu technology to offer up to 125 ps timing on all channels, glitch and setup/hold triggering and display and timestamp that is always on at 125 ps resolution.